David Cameron has chickened out of meeting Nigel Farage in Brussels, deciding to only hold a meeting with pro-EU leaders instead. Cameron was due to meet EU group presidents tomorrow to discuss his sham negotiation and technical briefing papers were sent out in advance. But Yellow Belly Dave has bottled it and will only meet with pro-EU politicians. The Prime Minister is chicken. I received my official documentation this morning to say that I was one of several meeting the PM tomorrow morning and he has now run away scared. Frankly I'm not surprised. Not only is the deal pitiful but he would not want me exposing the fact that even if he wins the referendum, the European Parliament will veto it. UKIP won the European Elections in 2014. 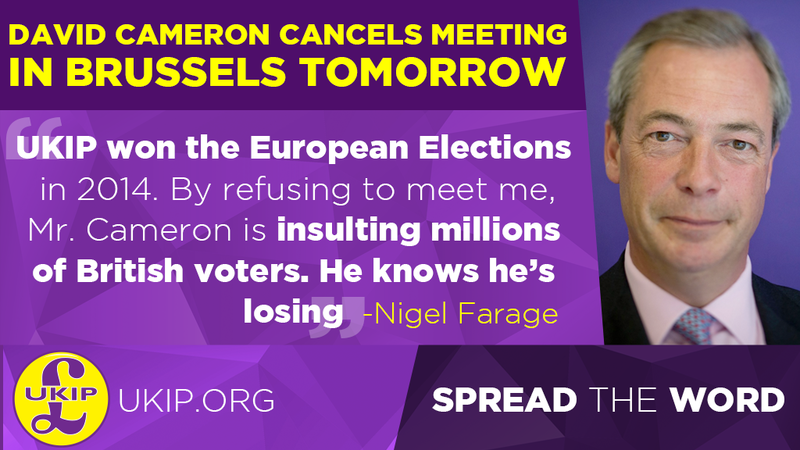 By refusing to meet me Mr. Cameron is insulting millions of British voters. He knows he’s losing.